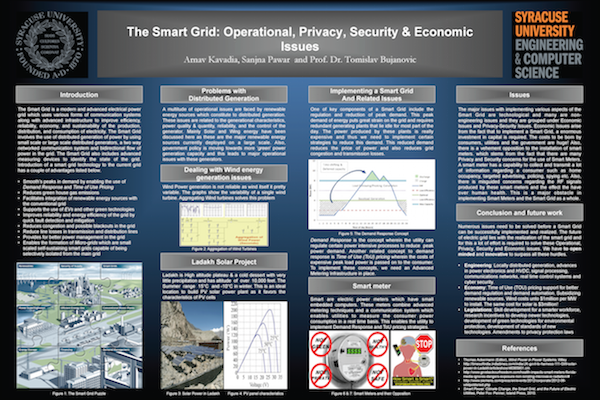 Graduate student Arnav Kavadia created a poster entitled “The Smart Grid: Operational, Privacy, Security & Economic Issues” based on the Spring 2015 interdisciplinary Smart Grid: Security, Privacy, & Economics course. He presented the poster at the SU College of Engineering and Computer Science Nunan Day Poster Competition on April 6, 2015 and at the American Society for Engineering Education Conference in Kiawah Island, SC on 17-18 April, 2015. Click on poster to see a PDF version.